I'm doing a personal Bible study on the KJV Only doctrine. KJVO advocates point to Psalm 12:6-7 as evidence for the inerrancy of the KJV (or the source manuscripts used by them). Can the referent of the pronoun "them" be interpreted in at least two different ways? It doesn't make sense to me, if it could, surely we'd never know what ANYTHING means. I thought we had to have rules in grammar in order for things to make sense. Secondly, what does the term 'preserved' in Psalm 12:7 refer to? The received Masoretic Text and its translation into English by the New American Standard Bible appear to be the best rendering of this verse in Hebrew and English, respectively. The logical antecedent of them are the “afflicted” and “needy” (from the first part of verse 5), and the logical antecedent of “him” is the same “him” (from the second part of verse 5). 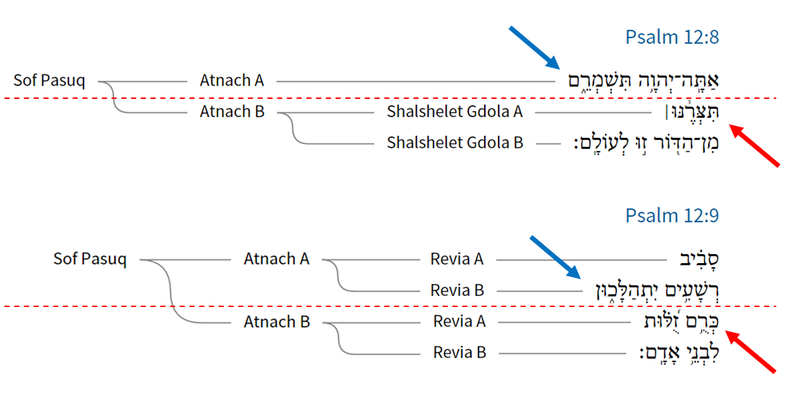 The dichotomy of Hebrew verse is that the second half of the verse (marked off by the strongest disjunctive accent within the verse) modifies the first half of the verse. The earliest witness in Hebrew comes from the Dead Sea Scrolls. The following text (Plate 890, Fragment 4) comes from the caves of Naḥal Ḥever, and indicates that the third person masculine appears in the first part of the verse. Please click on the image in order to enlarge and view the online source. The general consensus among scholars is that these fragments date somewhere between the third and first centuries BCE. In this respect, this fragment would be the best presumptive witness to the “original” version of this verse in Hebrew. Of interest, there is a distance of 1.25 cm between the word in the white box (תשמרם) and the word that follows (תצרנו), which is partial. This distance between the first half of the verse and the second half of the verse coincides with the dichotomy of each verse in the Masoretic Text. That is, the Masoretic Text, which would appear more than 1,000 years later, contains a system of cantillation, which is musical but is based on the logical divisions and dichotomies of the verses of Scripture. In other words, this fragment of the Dead Sea Scrolls contains the same separation (dichotomy) as the Masoretic Text. Please see the image below. 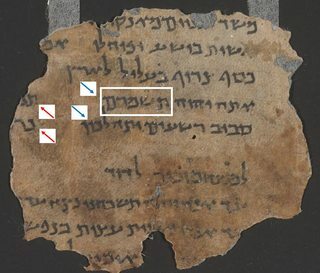 The blue arrows mark the last word of the first half of the verse, which coincides with the large spacing in the Dead Sea Scroll fragment found in the caves of Naḥal Ḥever. The red arrows mark the first word of the second half of the verse. In other words, the Jews appear to have practiced a system of dichotomy which will appear over 1,000 years later in the codification of cantillation by the Masoretes. 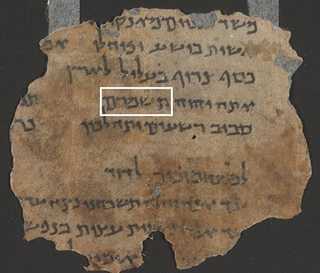 This dichotomy in this fragment is an exact coincidence with the received Tiberian Masoretic Text of today. These alignments of dichotomy and words therefore provide the best presumptive witness to the “original” version of this verse in Hebrew. There are four instances in this chapter where the first half of the verse (Part A) contains plural elements in literal or logical senses, which are then modified by the second half of the verse (Part B), which contain the parallel, but in the singular sense. In Hebrew verse, the point at which dichotomy occurs is the point in which whatever follows modifies whatever had preceded. As was noted in the fragment of the Dead Sea Scrolls discussed above, that dichotomy was set off by a literal 1.25 cm of spacing. 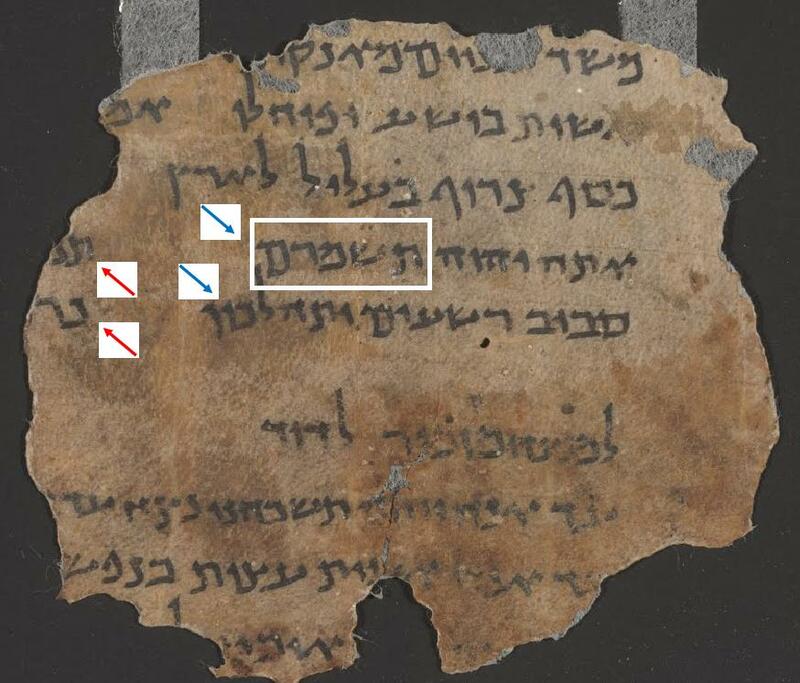 Thus the received Tiberian Masoretic Text matches the witness of the fragment found in the caves of Naḥal Ḥever in both words and verse dichotomies. That is, this Dead Sea Scroll fragment would be the best presumptive witness to the “original” version of this verse in Hebrew. Under this approach, the plain and normal reading of the received Tiberian Masoretic Text and its translation into English by the New American Standard Bible would appear to be the best rendering of this verse in Hebrew and English, respectively. Ambiguity is present in all languages. Just as the referent of "them" in verse 7 is ambiguous in English, the Hebrew also allows several interpretations, although I think that the "scholars" mentioned in the question probably have the conclusion right. Below is the text of the KJV with the transliterated Hebrew (BHS). The bold words are those in question. The three-letter roots in parentheses are the Hebrew roots behind the English words. The OP asks whether them refers to words or something else. Both conditions apply here. Thus, it is not out of the question that the suffix -ēm couldrefer to ʾămārôt in the previous verse. On the other hand, the BHS apparatus (cf. NRSV, below) suggests an emendation toward the Septuagint (Greek), which uses a first person plural sufffixes on both verbs in this verse ("keep us... preserve us"). The decision about the referent in the personal pronoun may be best pondered by reference to your second question about the word "preserved" in very 7. Here we have two verbs in parallel with very similar meaning: šmr (KJV "keep") and nṣr (KJV "preserve"). One could ask whether words or people are the most likely objects of šmr and nṣr. The first stich could go either way: words can be "kept" (e.g. Prov. 4:21), but Yahweh most often keeps people (Psalm. 16:1, 17:8, etc.). The second stich is more informative: the terminology nṣr + m- ("preserve from X ") is common, particularly in the Psalms (e.g. Psalm 140:1, 140:4, 12:7, 64:1, 32:7, 34:3). In every case as far as I can find, the one "preserved" is a person. Although the lack of grammatical concord posed by the masculine endings in verse 7 is not insurmountable, the context makes it most likely that a person/people are in view as the objects of the two verbs. Whether to reach back to verse 5 for a referent ("they....him") or to adopt a fairly minor and plausible emendation ("us...us") is less certain to me. Either way, this does not support the KJV-only interpretation mentioned in the question. 2. Bruce K. Waltke and Michael P. O’Connor, An Introduction to Biblical Hebrew Syntax (Eisenbrauns, 1990), 108, 302. 3. rēm < rēnû by an enclitic mem (<hand-waving>) and assimilation of the nun (after some vocalization change); rennû < rēnû without any consonantal changes. Not the answer you're looking for? Browse other questions tagged hebrew psalms referent-identification kjv inspiration or ask your own question. Misleading “but” in Matthew 5:22 KJV? Who is the God of God in Psalm 45:8? What landmarks were set of old time?